I put Halpern scales on mine after receiving it and it went straight to work in the kitchen. After a few days of use, I noticed some tiny dark spots around the handle. Upon removing the scales, I saw dots of rust on the entire handle. I was very surprised how it went straight for rust, no patina at all. I buffed it off, coated everything in a healthy layer of Froglube, and put it back to work. Again, I use this in the kitchen. It gets washed after every uses, but "uses" can be long enough that acids will remain on the blade for a while. It has started to show some staining on the blade (I'm guessing the Froglube is long gone there), but the handle seems fine. I do like the staining and hope it keeps darkening (one reason I chose 4V over RWL34 is because I enjoy a nice patina on a fixed blade). As far as performance, it's a nice knife, holds a good edge, but nothing mind blowing for my current uses. I think the high toughness is just not that important in the kitchen, especially in such a small blade. However, if I go out for a hike, I'm sure it'll make a great companion, and I absolutely love the ergonomics of the mule! The problem of a coherent civilization is the problem of living with ignorance and not being frustrated by it. Personally I think 4V and M4 should perform close enough to find it hard to tell the difference in real use. dogrunner wrote: I'd love a mili in 4v!! I put Halpern scales on mine after receiving it and it went straight to work in the kitchen. I do not understand why so many people use a non stainless knife in the kitchen. Isn't that asking for rust problems? There are so many great stainless steels and typical kitchen work does not require a heavy duty tool steel, so why not use stainless? I also do not like the thought of an oil or lube on my kitchen knife since that oil will go into my food. Did you do that to test the stainless properties of 4V? Carbon steels like 1095, 52100, Super Blue and White #1 are all extremely popular kitchen knife steels. Compared to them 4V is very, very stainless. Keep them clean and rust is not an issue. 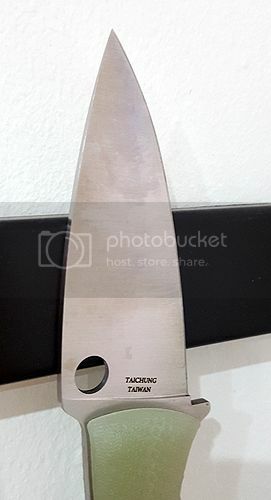 One if my most often used kitchen knives is in 1095.
bearfacedkiller - why do you prefer them to stainless options, what is the benefit in the kitchen? Ease of sharpening, or something else? First off, I do not prefer carbon steels to stainless steels. I am a bit of a steel junkie and like almost all of them. I have both stainless steel and carbon steel kitchen knives. I don't really prefer one or the other. I should also add that many people probably are using there mules in the kitchen because they don't carry fixed blades and don't have a lot of use for fixed blades. It is illegal to carry fixed blades as an EDC in many places is one of the reasons. People are probably just using the kitchen as a test bed for the various steels. I have used mine in the kitchen for no other reason than to compare them in similar uses. You are also probably correct in your statement that the needs in a kitchen do not require tools steels but that doesn't mean that us knife and steel junkies don't want to do it anyway. There are probably a number of reasons why carbon steels are still very popular in kitchen knives. One is tradition. In the early days of stainless knives many people believed that carbon steel was better and in the beginning it probably was. The rest of the reasons probably have to do with the fact that kitchen knives are usually ground thin, or at least they are supposed to be. Simple carbon steels like the ones I mentioned are easier to grind thin and can support that thin grind better. Depending on the hardness they can be tougher and therefore support thin grinds. They are also easier to get screaming sharp and they take a fine polished edge easily. They are also easier to touch up and repair. This is all somewhat subjective and you are correct that we have some excellent stainless steels that have many of the properties of these carbon steels. AEL-B is very popular in kitchen knives these days and I have heard it called the stainless 52100 a few times. Also, I think it would be hard to make a case against VG10 as a superior kitchen knife steel although it is a bit different than the other steels mentioned. So basically your question is valid and the answer is just that we are all steel geeks and we all like different things. Sorry, I tend to be long winded. Good info! Thanks for the response. I am still new to the knife world so I find this info very interesting. bearfacedkiller wrote: I should also add that many people probably are using there mules in the kitchen because they don't carry fixed blades and don't have a lot of use for fixed blades. Around my house most of my cutting is either cutting chili meat in the kitchen or taking apart cardboard boxes in the garage. You can use a mule without scales and I have a lot, but I've also just recently put scales on most of mine. But you can't carry a mule and use it out of the house without a sheath and a good sheath is much harder to find than a set of scales. I figured if I can make scales for a mule I can probably make sheaths as well so I have the materials for forming kydex waiting for me to have time to work on it. Dickson, Xplorer, thanx much for the detailed review and pics. Getting these Mule Teams out to the market is not an easy task and we really appreciate all of the detailed "real-world" testing. I'm currently using my Maximet Mule for outdoor activity as well food prep. It is performing well and holding up well. It goes without saying but I'll say it anyways: we appreciate the work and passion Spyderco puts into these blades. PaleMoon wrote: I do not understand why so many people use a non stainless knife in the kitchen. Isn't that asking for rust problems? There are so many great stainless steels and typical kitchen work does not require a heavy duty tool steel, so why not use stainless? I also do not like the thought of an oil or lube on my kitchen knife since that oil will go into my food. I did not buy this mule specifically for the kitchen; actually, it is a fairly sub-par blade shape for this application (too thick, short and broad IMO). I run F&B business and work 60-70 hours a week in this environment. As such, I have very limited free time, so taking the mule here was the only way for me to enjoy it at the moment. As I said, I love a good patina on a fixed blade! Like many, I feel it gives a knife more personality and history. I also appreciate it on a traditional slipjoint, but I tend to draw the line at expensive modern folders, so I felt the mule would be the only place I could check out a fairly rare tool steel from Spyderco. As far as the reason for non-stainless in the kitchen, I think bearfacekiller explained it perfectly. My 3 favorite steels for the kitchen are Super Blue, VG10 and AEB-L, the latter being extremely stainless. All steels have their advantages and disadvantages, so I will use each for different applications. For example, it would be hard to beat a nice, thin, high hardness Super Blue yanagiba for sashimi preparation, but it would be a horrible choice for prepping a lamb rack. Clearly, 4V would be better suited for cutting very abrasive materials or in a large chopper. However, the mule platform is possibly the cheapest way out there to sample the steel, and its versatile shape is meant to be tested in many situations where it will perform good enough without excelling at one specific thing. My mule will certainly get out of the kitchen, when I have the time. PaleMoon wrote: Clearly, 4V would be better suited for cutting very abrasive materials or in a large chopper. A cleaver in 3V would be fun! It means a lot that you listen to our experiences. This is one of the reason that customers of Spyderco have such high brand loyalty. Will be interesting what role this steel could fill. If I ever see a Spydie in 4V or V4E I will be buying. I've been reading a lot of the 3V/4V/V4E/PD1/Cruwear steels and I've seen quite a few knifemakers comment of how 4V is such a great steel and that it is the future and that of they could only choose one steel it would be 4V. I really like what I read about it, and would love to see a sprint of this soon to try out. I think there are a lot of potential new customers Spyderco could reach if they released more knives in these steels. Mainly their flagship models (PM2, Millie, Manix, Native, etc...and the Shaman and Manix XL and Manix backlock seem like GREAT matches for this class of steels) as sprints or dealer exclusives rather than something like the TUFF, which had a design that wasn't for everyone. I really hope to see these steels in these models (but my wallet doesnt!!). Not saying that they need to switch production steels to these ones (though Cruwear would be good I believe), but putting out some sprints in 4V, V4E, PD1, and 3V seems long overdue. Though 4V would be great, and I'd jump on it in a Spyderco, I still think K390 is what I would prefer. If the Manix 2 XL were in K390 I would flip out. K390 and 10V are just awesome imo. But, I cannot wait to get the Ankerson/Sanders Bowie in 4V. Also can't wait to get the Respect Bowie in CPM-154. A lot to look forward to this year. Doc, you might wanna consider the Police 4. 4v has been slowly replacing m4 at bladesports... nuff said. I truly appreciate toughness in a folding knife or small fixed blade. I do not chop, pry, baton, or abuse knives in any way. Toughness is about using a knife you love with confidence/without hesitation and having a forgiving edge when the unthinkable happens and a mistake is made. People that like flowers, have all kinds of flowers. It's the difference that makes the difference. It's a visual and aroma experience. While different steels have their differences, observing those differences requires other senses. May I ask we get a V4E mule next?